1. GDP, easy at 1-2-3: Investors are turning their attention to U.S. economic growth figures that will be reported at 8:30 a.m. ET. The Bureau of Economic Analysis originally reported that the American economy grew 2.9% in the third quarter, the fastest pace in two years. That initial GDP estimate is expected to be upwardly revised to 3%. There's more economic data coming out Tuesday. The Case-Shiller U.S. home price index for September will be released at 9 a.m., followed by consumer confidence data for November at 10 a.m.
2. Watching OPEC: Crude oil futures are declining Tuesday as traders worry that major oil producers won't be able to formalize a deal to cut output at a meeting on Wednesday. OPEC reached a preliminary deal in September to cut output for the first time since 2008. That tentative agreement sent crude soaring above $50 a barrel. But there's lingering skepticism over whether OPEC can keep its word. Crude oil futures are currently trading around $46.50 per barrel, down about 1% overnight. 3. 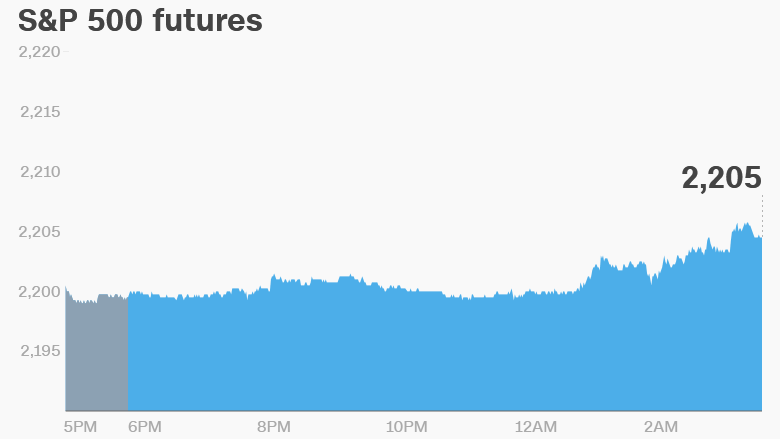 Global market overview: U.S. stock futures are pointing up Tuesday. The Dow Jones industrial average, S&P 500 and Nasdaq all declined Monday, taking a step back from all-time highs. European markets are mixed in early trading, with mining companies putting a drag on various indexes, including London's FTSE 100. Asian markets are closing out the day with mixed results. 4. O'Hare airport strike: Hundreds of workers at Chicago O'Hare International Airport are on strike Tuesday. The airport is a hub for both American Airlines (AAL) and United Airlines (UAL). Janitors, baggage handlers, cabin cleaners and wheelchair attendants are asking for a $15 hourly wage. The strike won't affect more critical workers, such as air traffic controllers and security screeners. Meanwhile, Lufthansa (DLAKY) pilots in Germany are in the midst of the fifth day of a strike. 5. Stocks to watch -- Time Inc., Tiffany: Shares in Time Inc. (TIME) could be volatile again Tuesday after the New York Post reported late Sunday night that the company rejected a $1.8 billion takeover offer. Shares surged 16% on Monday. A Time Inc. spokeswoman declined to comment. Investors will receive insight into the health of the high-end consumer market when Tiffany & Co (TIF) reports earnings Tuesday morning before the opening bell. Investors will look to see what Tiffany says about demand for luxury jewelry this holiday shopping season and potential challenges posed by the surging U.S. dollar.